Adjusting to our life in Spain was much easier than adjusting to Thailand. Spain was probably easier because it’s first world and much more modern. Plus Chuck and I both speak a bit of Spanish so it’s easier to figure things out. Strangely, we found more English speakers in Thailand than here, probably because we went to main tourism hubs in Thailand. But here we’re in a mainly Spanish town. Another reason is because once you’ve adjusted to something like living in Thailand, it gets easier to deal with big changes. That said, there are some definite differences between Spain and the USA. Some were expected and some threw us for a loop upon arrival. Maybe all of these don’t apply to everywhere in Spain, but they definitely apply to our town and our house. 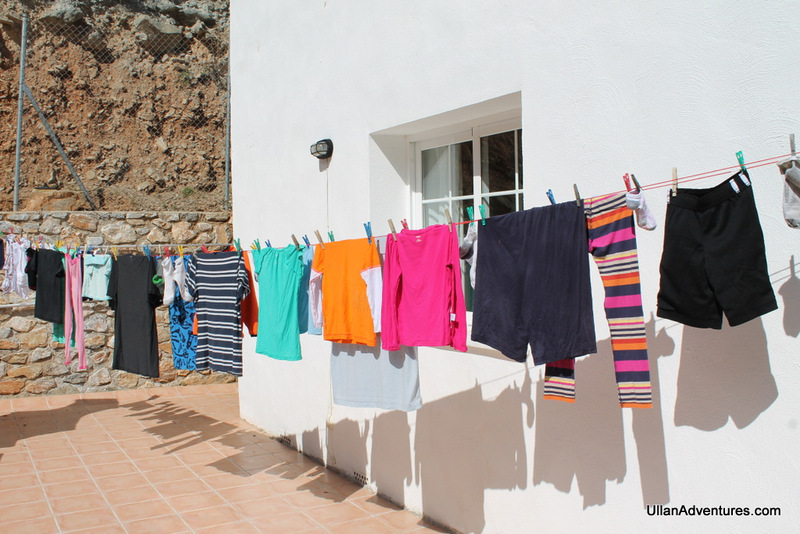 Line drying clothes. Apparently they haven’t heard of this amazing invention called a clothes dryer here and all clothes (well everything you wash) are hung out in the sun to dry. 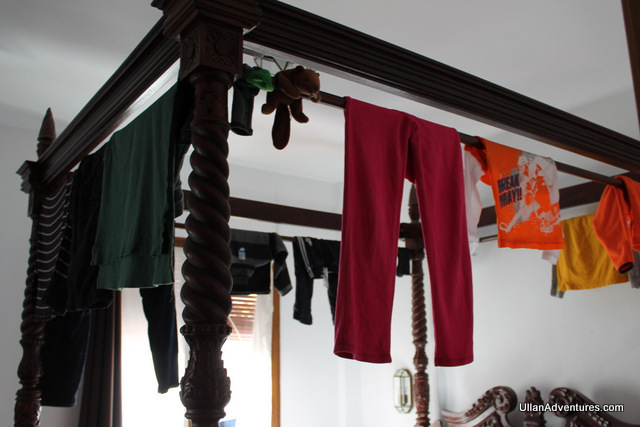 This isn’t much of a problem as the weather is warming up, but in late January, it would take all day for our clothes to dry and even then we’d have to hang them inside overnight. I never thought I’d be planning my laundry around the weather forecast. Teeny, tiny clothes washers. Maybe it’s because you’d need too many lines to dry the clothes outside, but the washing machines are tiny here. I miss my super capacity plus that could wash clothes for a small army in 1 load. No heat in our house. This might be only our house and location although we looked at a few houses like this: we don’t turn on the heat in the house. Not because we don’t need heat but because apparently it’s too expensive. 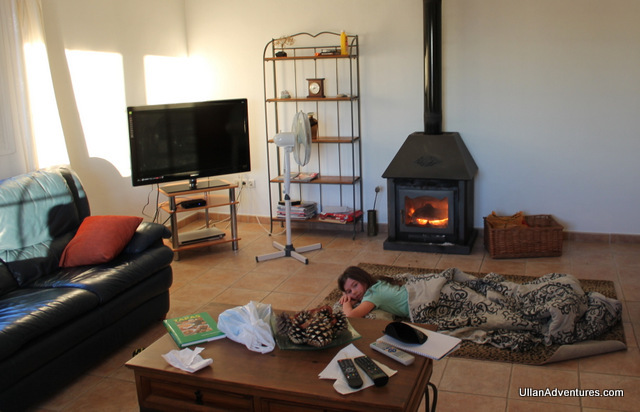 We have a wood burning stove we use in the evenings to heat the house and the sun heats it during the day. Great concept when its warm outside but it’s not very warm here January through March so we’ve been FREEZING this winter. We’re all bundled in sweatshirts and warm pants inside and will go out in the sun to warm up. We have 2 space heaters that move around the house with us and I’ve been known to wear gloves in the house. TV. As you’d expect, TV watching here is quite different. However, what is odd is we only get 1-2 channels in Spanish and loads of German channels with a few Russian, French and Italian channels thrown in. At first we got loads of BBC channels but we lost all those early on. I watched the Olympics on the German channels entirely in German. Let’s just say I saw lots of biathlon and little snowboarding or figure skating. Since the Olympics are over, we don’t even bother to turn the TV on. Grocery store shopping carts. I could not figure out how to get a shopping cart the first time we went grocery shopping as they’re all chained together. I was pissed when I realized we had to pay $1 to use the cart. UNTIL I realized that it’s just a deposit to unlock the cart, and when you relock the cart after you use, you get your money back. Guess it prevents people from not returning them to the proper place (or stealing them). Kind of genius actually. 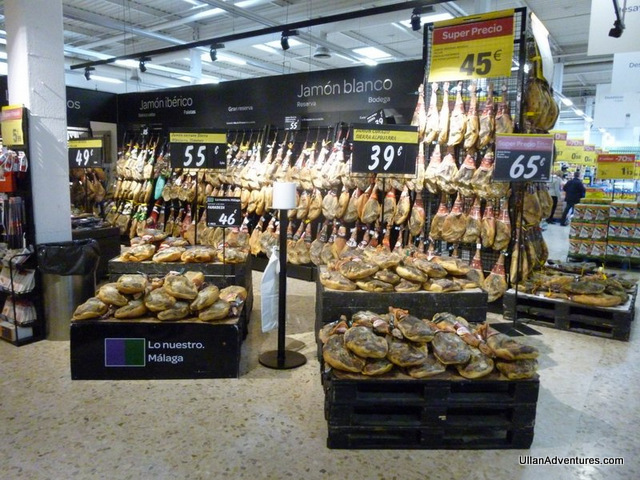 Grocery stores are smaller and have an entire aisle devoted to ham. And not prepackaged ham, but hanging racks of ham hocks. The seafood counter is full of interesting things as well. 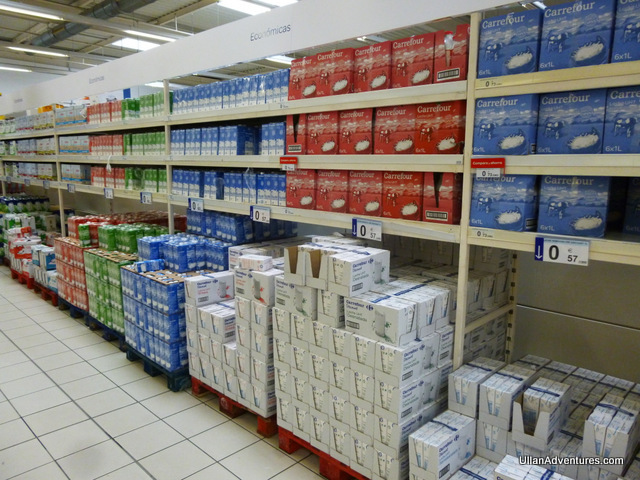 At one of the bigger stores, there is an entire aisle devoted to boxed, room temperature milk. Think “Parmalat”. So many ham hocks, how can I possibly choose?!? The best aisle in the grocery store is the wine aisle. 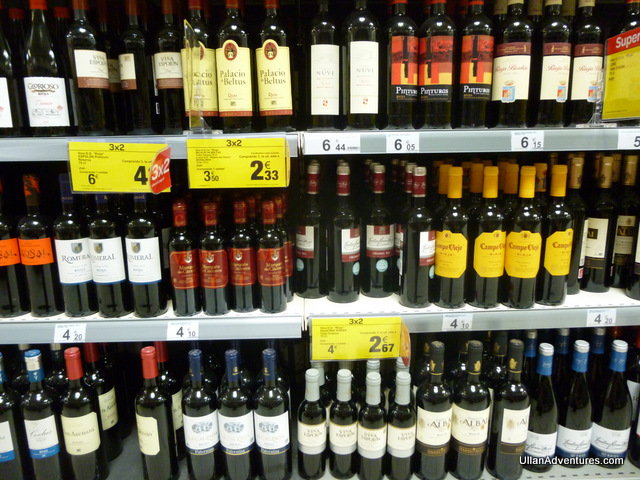 Of course I always love a well stocked wine aisle, but what makes it so great is how cheap the wine is here! You can find many bottles for $2-3. I usually splurge and go for the $5 bottles. I think the most expensive wine at our local store is maybe $12. Cava is super cheap too. My personal favorite is about $3/bottle. ¡Ole! Cheap, super delicious bread. Since I’m on the subject of cheap food, I have to mention the cheap fresh-baked baguettes and other breads from the bakeries. We have been devouring loaves of bread here, especially our self-proclaimed “Baguette Lovers”, aka Mara and Beckett. Tapas. OK, I’m not done with food yet. Another wonderful thing about Spain is the free, yes free!, tapas you get when you order a sangria. The sangrias are delicious and the fact that they come with a little appetizer for free is such a wonderful thing. Menú del día. One last thing about food, I promise. Many restaurants have a “Menú del día” or menu of the day. It’s such a deal! At the one restaurant we like, we each got a huge appetizer (that was practically a meal), a main dish, bread, dessert, and we were given an entire bottle of wine to split for about $10€ or less than $14USD each. Operating hours for businesses. I still have no idea when many stores open or when they close for siesta. All that I know is almost everything closes down at 2-3pm and reopens later in the evening. And even businesses like grocery stores are closed on Sundays. Meal times. The Spanish eat lunch around 2-3pm and dinner at… 9? 10? I don’t really know as the kids and I are probably already in bed by then. Most restaurants don’t open for dinner till 7 or 7:30pm. The Spanish dress so stylish. Just about everywhere we’ve been, I’ve noticed that the women AND men look so stylish and put together even if they’re just out at the grocery store. It’s not like they’re dressed up all crazy, but they definitely look chic and well dressed. No jeans, no sloppy, slouchy t’s, no sweatshirts. Even the guys will be wearing a nice button down and red pants and look fashionable but casual like this is normal and how they always dress. Let me just say my “Hawaiian bohemian hobo look” is kind of out of place here. Roundabouts. There are shockingly few stop lights here and I’m not sure I’ve seen a 4 way stop as they use roundabouts, aka traffic circles, instead. You do get used to them after a while, but the huge ones with stop lights in the circle are still confusing as hell. Twisty, turny roads. I have never ever ever seen so many tiny, twisty, turning roads in my life. I guess it makes sense since our town is set into the mountains and cliffs. Think hair-pin turns with only enough room for 1 car to get by and mirrors set up so you don’t bash someone coming from the opposite direction. Can’t cross the center line on a road. Most of the roads here use a white line in the middle instead of the double yellow line we use in the USA. However, you aren’t allowed to cross the white line or you could get fined by the police. Seems to make sense until you realize this means you can’t park in an open parking space on the other side of the street or turn into a parking lot (or gas station) on the other side of the street. Instead you must drive down to the next roundabout, and come back in the other direction or risk being fined. Weird road signs. One of the fun things about traveling is the road signs around the world. 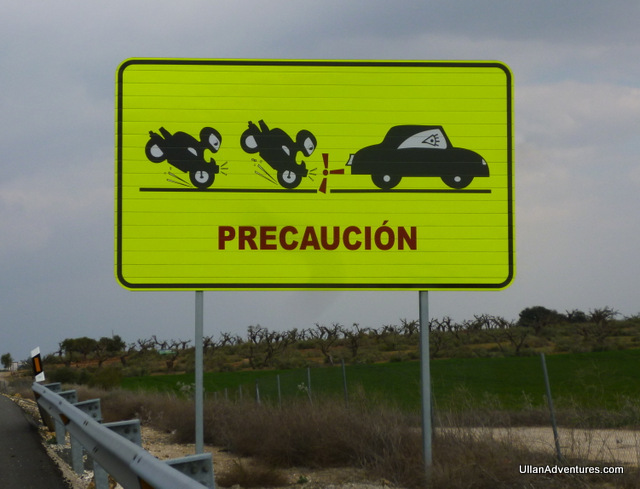 See below for our favorite road sign in Spain. Beware of ninjas on motorcycles?? ?